These effects are designed to be performed from the intimacy and casualness of your friend?s living room to the trade show floor or the professional stage. Here Banachek presents mentalism like a home-cooked meal . . . something for everyone and sure to be enjoyed by all. From mentalism to mental magic, Banachek shows how to make mentalism fun and friendly. Make the value of a spectators playing card slowly appear on your arm in blood red . . . anywhere, anytime! Reveal a thought-of number from across the distance separated by phone lines. Engage two people in a fun routine where the performer predicts a page number and a word seen by a volunteer on an invisible Palm Top computer. Become a human lie detector in a thrilling and comical adventure. This DVD continues from Part 1 with close-up, stand-up and stage mentalism and mental magic with additional routines including anywhere, anytime effects plus staggering psychological ploys. Learn a multi-phase routine weaving audience direction and sleight-of-hand into one smooth effect. 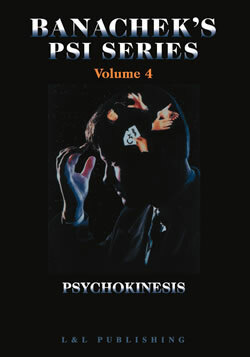 Also, learn the inside secrets of what Banachek considers one of the most powerful tools in the mentalists arsenal Pocket Writing. 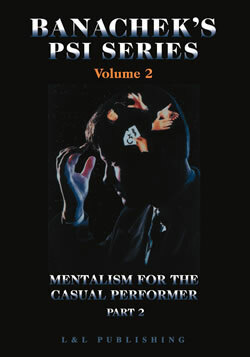 This DVD includes Banacheks discussion of his Buried Alive escape, his Bullet Catch illusion now used by Penn & Teller, the difference between mentalism and mental magic plus comical anecdotes about blindfold drives. You will also see a television clip of Banacheks Buried Alive escape hosted by William Shatner and TV footage of one of Banacheks early Blindfold Drives. Do you want to find a needle in a haystack Using the power of your mind and a little help from your volunteer, you can find anything through your heightened sense of touch. Almost anything you can do in mentalism can be re-enacted using Psychophysiological Thought Reading. This DVD also includes Banacheks first national television appearance. Here he uses the Psychophysiological response to find a playing card hidden in a shopping mall. Learn how to bend cold, hard steel with the power of your mind. Make physical objects move, twist and curl up like a wet noodle at will. In true Banachek style, each move, gesture and psychological subtlety is covered in detail. This DVD stands alone from Banacheks previous work by presenting new, additional details and methods on bending silverware. This also includes methods of bending coins keys, nails, and spikes plus moving objects like pens and pencils. Included is the true story behind Banacheks participation in the Alpha Project, a four-year study that culminated with scientists validating Banacheks psychic powers that propelled him into the national spotlight!